An effective Business Intelligence (BI) solution is one that allows companies to access multiple data sources, integrate and analyze large quantities of data, and finally produce valuable information insights that can be used to make informed business decisions. BI facilitates in obtaining market intelligence both on products and customers, and can make the difference between a company being ahead or behind its competitors in anticipating and addressing the next big market trend. 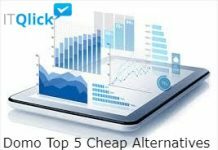 We at ITQlick understand that one of the challenges faced by a large business is when it is unable to address new challenges arising from competitors that might provide niche solutions and are better able to react to market needs. Therefore, in our review we look to recommend the best BI solutions that offer maximal available functionality that is key to a business’s decision making process. In our evaluation the best return on investment, we took into account factors such as software investment, growth strategies, and adaptability to changing business requirements. After examining numerous BI solutions, some of our best recommendations include the following. 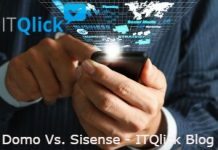 Sisense is a scalable product offered both as a cloud-based and on-premise solution, while also being mobile device access ready. It is beneficial for large businesses as it has a proprietary in-chip technology that allows efficient processing of large data volumes for quicker data analysis. In addition, Sisense is focused on providing detailed visual information in graphical settings with easily customizable dashboards and reports linked to KPIs. There are also collaboration tools which are important in helping large teams in decision making. 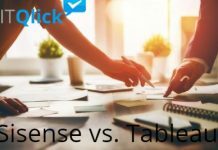 Another Sisense advantage is that it offers a free trial period so that companies can experience the power of this software and determine its fit to their business requirements. Pentaho is another product which focuses on business enablement by providing predictive analytics tools to aid in decision making. Pentaho does this by proactively analyzing data, and recommending actions or strategies for address a given issue based on historical and trend analysis. This is an important feature for large businesses that usually have large quantities of data, but lack effective means for converting it into actionable intelligence. Pentaho can easily integrate multiple data sources and provide information in both visual reports and dashboards. As a mobile device access ready product offered as both a cloud-based and on-premise solution, companies can choose the best deployment option for their needs while also utilizing its free trial period. This is a SAP application software which offers a powerful BI tool for businesses, along with a unique SAP Lumira edition that provides employees and small teams with all the data analysis tools they need in a desktop setting, which makes it an effective self-service BI solution. SAP Business Objects BI has one of the highest rated Predictive Analysis tool sets in the industry – an important business enabler for many large companies. As both an on-premise and cloud-based solution, large businesses can leverage both SAP’s large application portfolio as well as its rich BI functionality to meet their needs. This is an important benefit, especially if the organization is considering consolidating or migrating to the SAP platform for all their internal software needs. Instant Answers is offered as an on-premise and cloud-based subscription service. It accesses numerous data sources and provides a natural language interface for querying information through questions, allowing large enterprises to quickly model, interpret and gain valuable information insights without the need for any technical knowledge. There are also collaboration features as well as customizable reports and dashboards. Furthermore, this solution’s Smart Machine technology learns based on user query history, and recommends solutions that facilitate decision making. These are important benefits for a large business looking for an effective information analysis support. 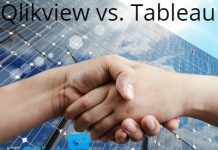 Tableau Server is a scalable, mobile device access ready BI software that is available as an on-premise solution. 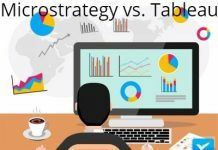 It supports embedded analytics where dashboards can be embedded in existing workflows or integrated through its API toolkit, and its collaboration features facilitate joint decision making. Companies also have the option to migrate to its cloud-based solution, as well as provide users with a desktop edition for active querying, or the reader edition for viewing information such as dashboards. There is a free trial period available. 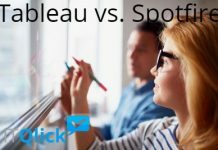 Tableau Server is an effective tool for large businesses which need a variety of deployment options.